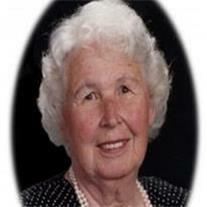 Nelda Elaine Huber Anderson, 87, passed away Sunday, February 5, 2012, at her home in Mesa. An Arizona native and the youngest of 12 children, Nelda was born on the family farm east of Mesa to Arizona pioneers, John Jacob and Percis Huber. After graduation from Mesa Union High School, she attended Utah State Agricultural College in Logan, Utah. There she met and married her husband of 58 years, Jay O. Anderson in the Arizona Temple. Following WWII and graduate school in Maryland, they moved back to Logan where they lived for 33 years and raised their 6 children. Nelda was busy in community and church activities. As an active member of the Church of Jesus Christ of Latter-day Saints, she served as a stake Primary president, ward Relief Society president, and as a teacher in both the primary and young women’s organizations. She also worked in the PTA, serving as a chapter president. In 1985 following retirement, Jay kept a promise to Nelda and returned her to live in Arizona’s warmer weather where they served as officiators in the Mesa Arizona Temple for over 12 years. Jay died in 2002. Nelda and Jay loved to dance and traveled to attend dances around the West. Nelda was an accomplished family woman and homemaker. She took pride in her children and the things she did in her home. As an outstanding cook she was known for her chocolates and cake decorating. Nelda is survived by her six children: Wayne (Genan) of Orem, Utah. ; Ray (Lynn) of Mesa; Russell (Charmaine) of Orem, Utah; Elaine (Doug) of Canyon Lake, Texas. ; Dale (Helen) of Tucson, and Keith (Barbara) of Deweyville, Utah. She also leaves thirty-five grandchildren and thirty-two great grandchildren. She was preceded in death by her parents, sisters Olive, Mattie, Thelma, Mae, Inez and Irma, and brothers Lee, Ernest, Albert, Waldo and Paul. A memorial service will be held Saturday, February 11 at 11 AM in the LDS chapel at 422 E University Dr. A viewing will be held Friday, February 10 from 6 to 8 PM at Bunker’s Garden Chapel, 33 N. Centennial Way, Mesa, and for one hour prior to the memorial service. Burial will be in the Mesa City Cemetery. In honor of Nelda, donations can be made to the Perpetual Education, Humanitarian or Temple Participation Funds of the LDS Church.